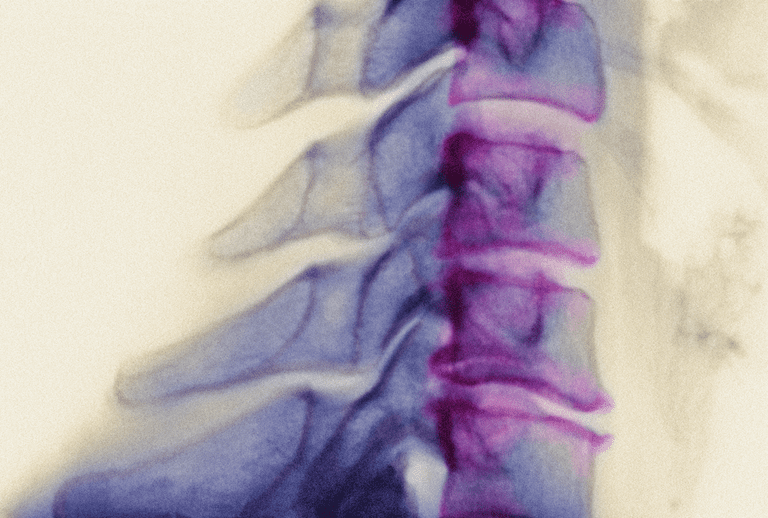 Vertebral end plate is the place—that actually serves as an interface—between the intervertebral disc and the bone (of the vertebral body) underneath. At first consideration, it may seem to you like an end plate is not fully bone, and not fully cartilage, but a combination of the two. And you may be right. According to the article "The Role of the Vertebral End Plate in Low Back Pain," the end plate a bilayer of cartilage and bone that creates separation between the more pliable disc and the rigid vertebra. In the low back, the spine carries a lot of load and is subject to strong forces of movement. The discs, on the other hand, are lacking in blood vessels. As the intermediary substance between the two, the end plates are charged both with being strong to help prevent vertebral fracture and being porous to help nutrients flow between cells in the disc and capillaries in the bone, Lotz, et. al say. End plates are perhaps the most vulnerable area of the discs and are easily damaged when compressed. When this happens, it may increase communication activity between inflammatory substances located in the disc and the blood vessels located in the bone marrow. A damaged end plate, Lotz, and fellow researchers say, can provide a site for reactive bone marrow that includes proliferating nerves susceptible to movements, changes in positions, (i.e., mechanical stimuli) and also to chemical stimuli. The problem is, this type of innervated end plate damage can be difficult to detect with diagnostic imaging tests such as MRI. For this reason, Lotz, Fields, and Liebenberg say that even though innervated end plate damage can be a source of chronic low back pain, doctors probably don’t consider it much when evaluating their patients. According to Nguyen, Poiraudeau, and Rannou, MRI may be able to detect changes in the bone layer of the end plate that could be associated with degenerative disc disease and chronic low back pain. These are called Modic changes. The researchers assert that such changes may be related to local inflammation, and suggest that Modic changes may be a biomarker for identifying a link between the bone changes and pain in certain types of patients with low back pain. This, in turn, may facilitate more targeted back therapies. Hadjipavlou, A.G., Tzermiadianos, M.N., Bogduk, N., Zindrick, M.R. Review Article. The pathophysiology of disc degeneration: A Critical Review. The Journal of Bone & Joint Surgery. October 2008. Lotz, J.C., Fields, A.J., Liebenberg, E.C. The Role of the Vertebral End Plate in Low Back Pain Global Spine J. 2013 Jun; 3(3): 153–164. Nguyen C., Poiraudeau S., Rannou F. Vertebral subchondral bone. Osteoporos Int. 2012 Dec.
Wheeless, Clifford, R., III, M.D. Cartilagenous End Plate of Intervertebral Disc. Last Updated April 2013. Is Your Lower Back Pain Caused by Lumbago? What Do You Do When Your Teen Has a Big Hunchback?